I should really fill you in, before you even read on any further; that this cheesecake is made with cake. 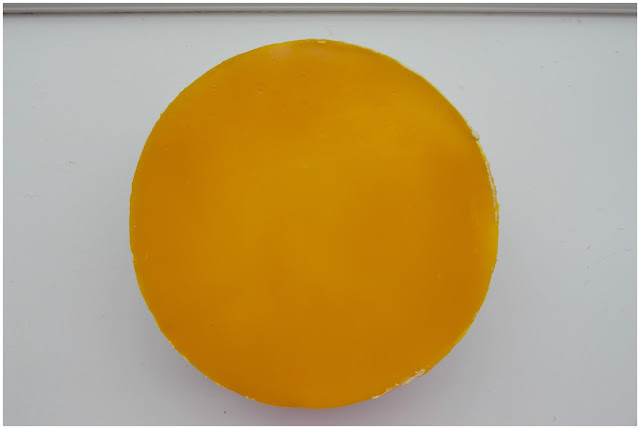 An actual cake base, not biscuit. Cake. I don't like cheesecake with a biscuit base. Unless it's a baked cheesecake. 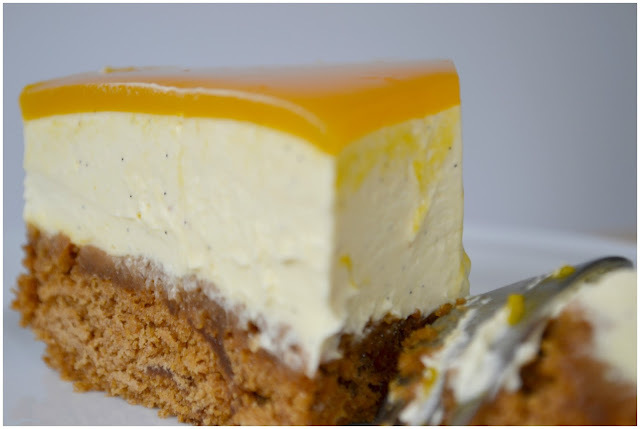 I know that might sound mad, but I just think no bake cheesecakes are all kinds of gross if they have a biscuit base. I love the cheesecake toppings of a no bake. Just not the usual biscuit bases... You feel me? I just don't like them! 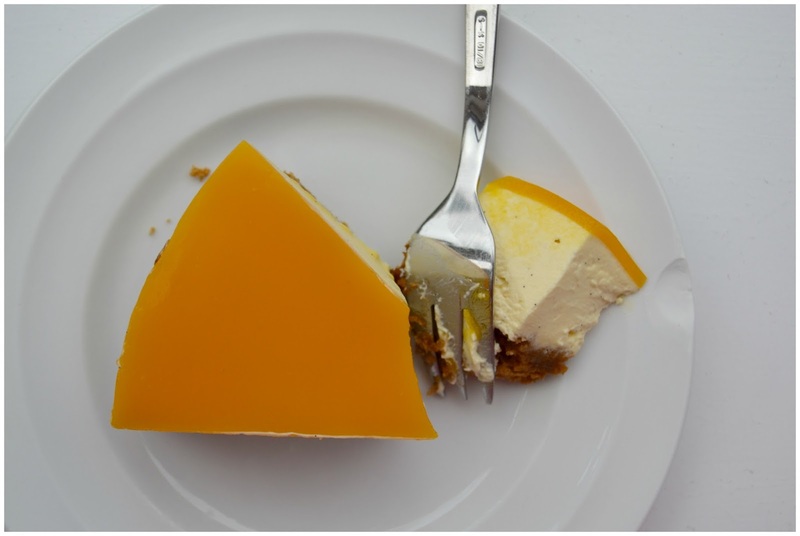 I will always, when I can, substitute the bottom of the cheesecake with a sponge type bottom. Red Velvet Cheesecake, Vanilla Cream Mascarpone Cheesecake, Baileys Chocolate Cheesecake and now Mango and Ginger Cheesecake... you get the idea. It's also a no make, no bake, you just putting together ingredients kind of recipe so in all fairness, this could not be any easier! 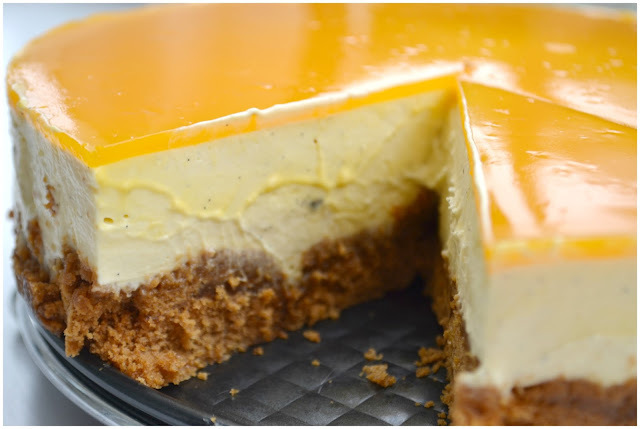 You buy a few small, readily available ingredients and bobs your uncle, you have a cheesecake. It's domestic god/goddess at it's finest and you really won't have lifted a finger! Cut up the two loaves of ginger cake and squash them into the bottom of an 8 inch round spring form tin. Whip the cream cheese together until smooth and add the cream and vanilla seeds from inside the pod. Add the sugar and whip until soft and light. Be careful not to over whip. 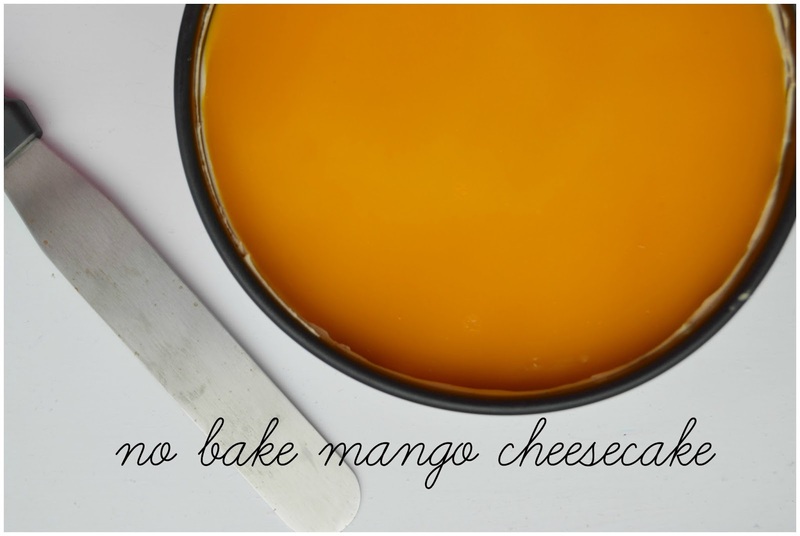 Fold in half the bottle of mango puree into the cream/cream cheese mixture until fully incorporated. Pop half the mixture in on top of the ginger cake and smooth it out. Add the other half in and smooth out the top as best you can. Put the pan in the fridge for at least two hours, or until set. Over night is best. After about one hour, the cake should be firm enough to hold the mango mirror glaze. Add one tablespoon of hot water into a bowl and sprinkle in the gelatin powder, stir around until it's fully dissolved. 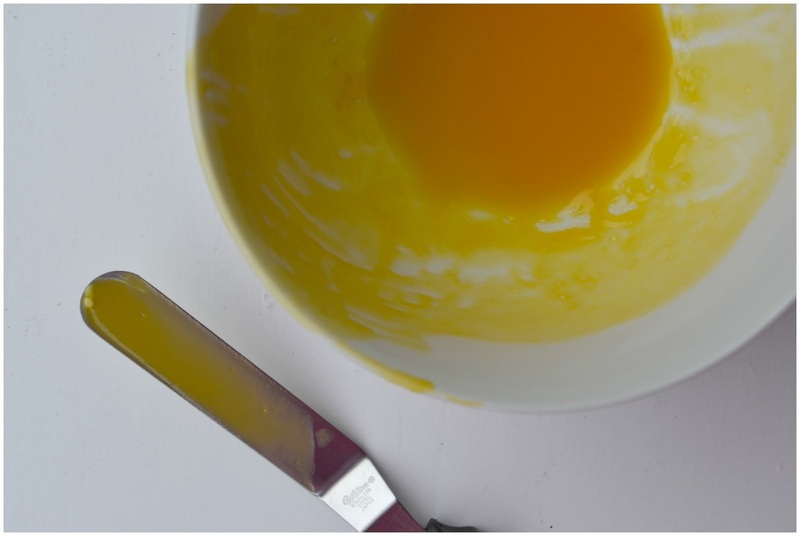 If it doesn't fully dissolve put the bowl into a hot water bain marie, and keep stirring until it does. 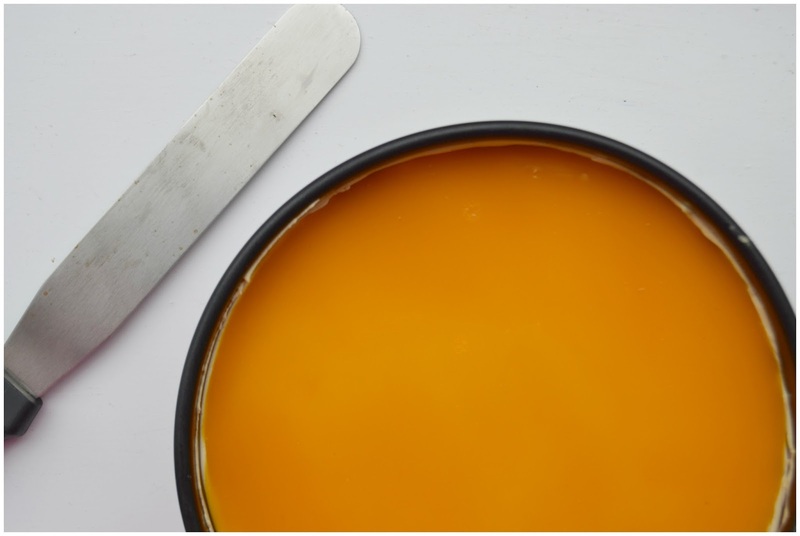 Pour in the rest of the bottle of mango puree into the dissolved gelatin and give it a quick stir. Pour that mixture than straight on top of the cheesecake mixture and smooth it out evenly. Put the whole thing back in the fridge to set up, again, over night is best. To remove the cake from the spring form tin. Put a sharp knife under some hot water and run arounf the edge of the inside the tin, before popping the clasp. The cake will come away much cleaner from the sides. The Great Irish Bake Off has started up again and this year I have a friend baking in the tent. I got to know her through my own time on the Bake Off in Season 2 and I was delighted to see she got off on a very good start the other night!! 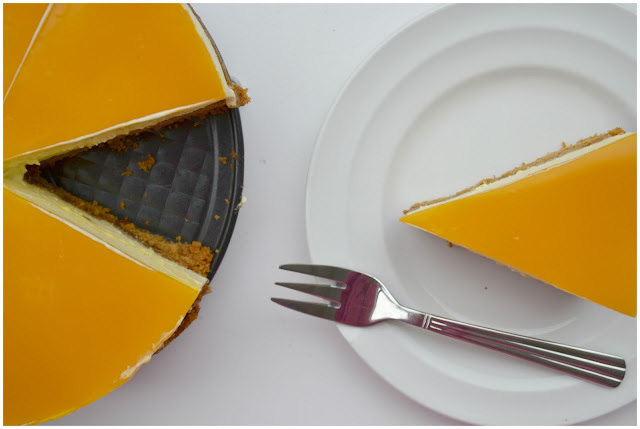 This week was desserts, and the technical challenge was a very persnickety gelatin infused, biscuit baked, no bake mango and something or other (I really can't remember!!) cheesecake. On account of my dislike for biscuit bases, I refused t follow the recipe exactly but have paid homage to the mango in the recipe above. So it's almost the same thing right? 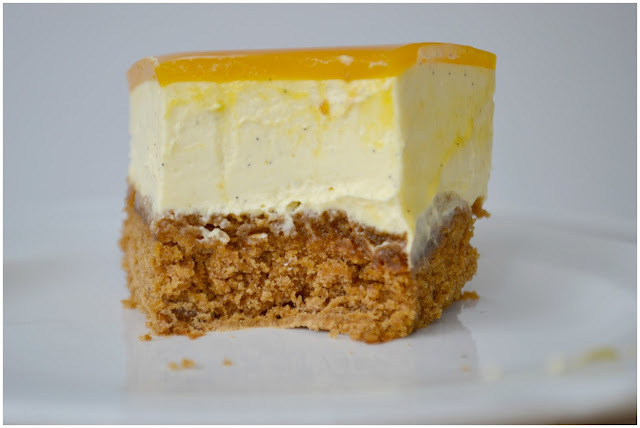 A no bake, cheats make, cheesecake that is genuinely great!! One to pull out for the next dinner party... You're friends will love you for it!! 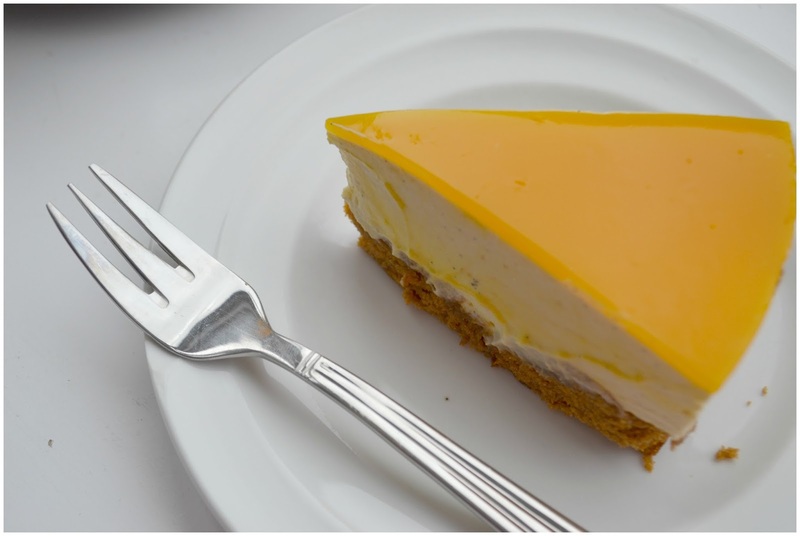 I adore cheesecake, baked or unbaked - though I've yet to try one of those Japanese cheesecakes and I've never had one with a sponge base as you've made either. It looks divine Hazel, I'm actually salivating here thinking about it (sorry!). Now I really like the sound of this... Especially as I don't have a kitchen nor oven at the moment! The mirror glaze looks fantastic! I don't think I've tried a sponge bottom based cheesecake either. I get what you mean about standard biscuit bases. 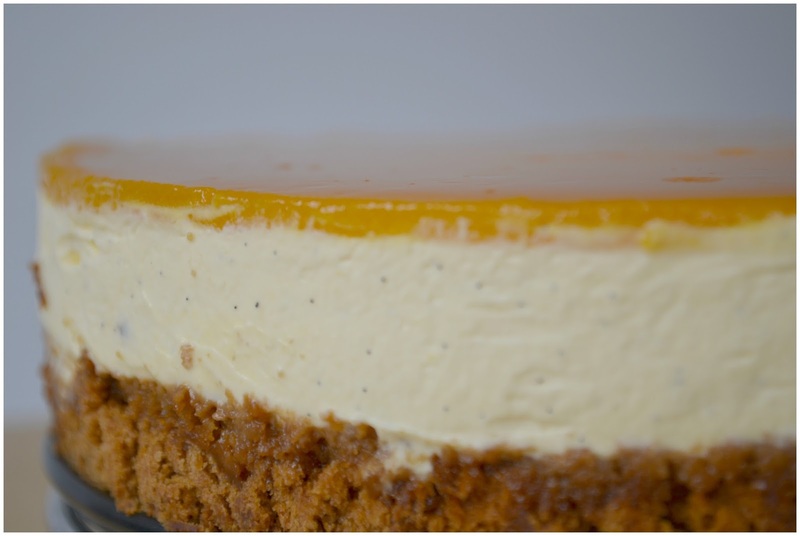 Although I love digestive biscuits I'm never that fussed with them for cheesecake bases. I generally prefer ginger nuts or a crumbly hobnob for a base. Looks amazing, I so want a big slice now!